The Berry Schools write to Mr. Meadows informing him that Martha Berry can not and will not take advantage of her friendship with the Fords by requesting they consider any cases brought to her attention. The Berry Schools suggest that, in the meantime, Mr. Meadows take up the matter with Mr. Ford directly, instead of using Martha Berry as an indirect avenue of discourse. 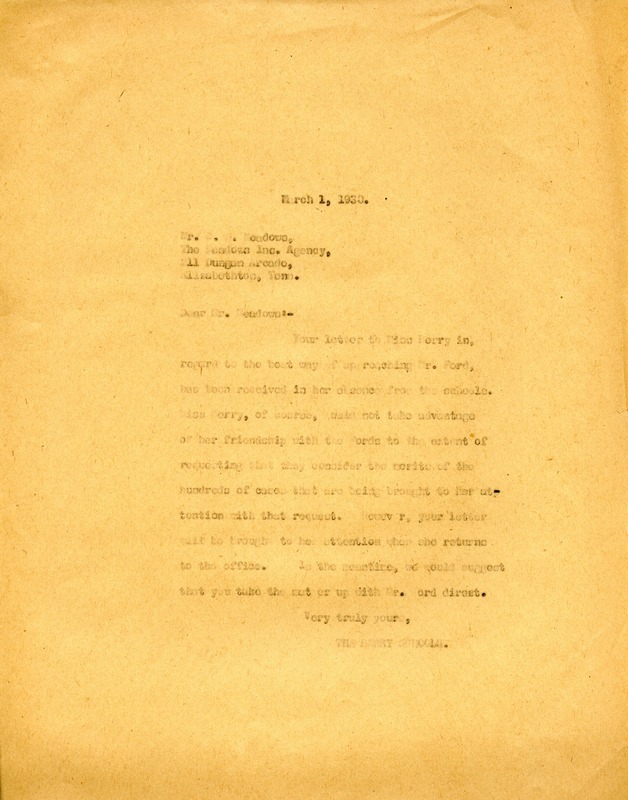 The Berry Schools, “Letter to Mr. Meadows from The Berry Schools.” Martha Berry Digital Archive. Eds. Schlitz, Stephanie A., Jordan Brannen, Chelsea Risley, Lindsey Purvis, Christy Snider, Angela McCavera, et al. Mount Berry: Berry College, 2013. accessed April 23, 2019, https://mbda.berry.edu/items/show/13391.